Warrington head coach Tony Smith believes his side have an advantage going into the play-off game against Hull FC due to their knockout record. Smith has guided Wolves to three out of the last four Challenge Cups, which is a straight elimination competition. 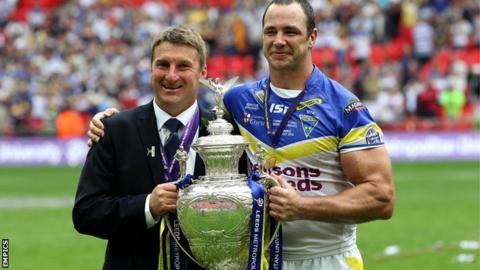 "It might do us some good as we don't mind playing that knockout rugby league," he told BBC Radio Merseyside. "Hopefully we'll respond to it like we do the cup and we'll get out there and fight for our lives next weekend." After finishing second in the regular season behind Wigan, the Challenge Cup holders were beaten 28-6 by St Helens at the Halliwell Jones. Wolves will face Hull FC on Saturday after they beat Huddersfield in their play-off match, looking to progress to the semi-finals where Wigan have Clubcall from beating Catalan Dragons and so can choose who they want to face for a place in the Grand Final. "We've earned the right for a second chance and we've worked hard to get that," Smith added. "We're not thinking about Old Trafford just at this stage, we'll look forward to a game next weekend to make sure we're at our best."